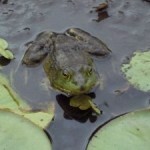 First off, Susan and I would like to thank all the photographers who entered the FROGS ARE GREEN photo contest. We were thrilled to receive your entries and it was incredibly difficult to pick a winner. We received entries from all over the world. Because we had asked for a frog picture in a natural setting, we felt we had to stick to our own rules. That said, we got some wonderful photos of frogs in unusual places. Next year, we will have a category for this. We would like to do a separate post in the coming weeks highlighting these photos (with the photographers’ permission, of course). Of the remaining photos, Susan and I each separately picked five favorites. From the photos we had chosen in common, we then picked one winner and one honorable mention. Both Susan and I were struck by the unusual composition and peacefulness of the photo below of frogs resting on leaves so we are giving an Honorable Mention to June Dufour. 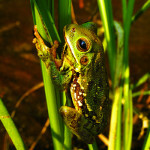 To all the photographers: With your permission, we would love to insert your photos in future posts on FROGS ARE GREEN. We would, however, contact you before using the photo to get your permission. Your name and a link (if desired) would be included. We think your beautiful photos deserve to be seen! Thanks again for participating in our contest! This entry was posted in Frogs Are Green contests and tagged Frogs Are Green photo contest, photographs frogs, winner FROGS ARE GREEN photo contest. Bookmark the permalink. What a delightful idea, contest, pictures! Thank you. As a Sonoran Desert dweller, I particularly appreciate “green” things and stuff. Thanks, Joy, for your comment! Keep your eye out for the Sonoran Desert toad! Wonderful photos. We have these green frogs and they are a delight. We’ve always called them tree toads or tree frogs. (I know frogs and toads are not the same, but we get careless in our nomenclature.} I ran across one of these little beauties as I was pruning a holly bush in front of the house. I didn’t see him (her?) until I clipped into the bush. He was clinging to one twig that rose up from the center. He completely ignored me. I slowed my pace and continued clipping more slowly until his was the only branch left. He never moved. Of course, I left him and went inside for the evening. The next morning he was gone and I clipped the last twig. There’s still plenty of bush branches left for him, just 8 inches shorter. We also see them on the glass sliding patio door some evening, giving us the underside view. And of course, we hear them singing. What a joy. Thanks so much for your comment! 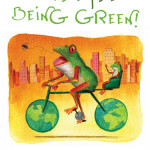 Sounds like the tree frog loves your holly bush, and very nice you let him be to enjoy it! What a great idea! I love the pictures!!!! 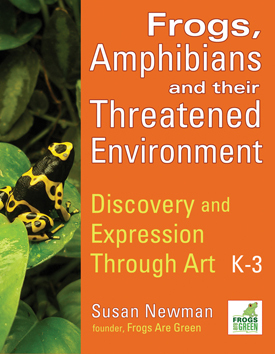 Do tree frogs from the rainforest count in this contest?